Ability to assign job to production person. Print lot tags with all lot info for pressmen. Allows for multiple “ship to” addresses and sample “ship to” addresses per job. Creates unlimited shipments; print packing slips, Bills of Lading and carton labels. Create a Vendor PO from any job. Track your actual costs and print powerful profit and loss reports per job. 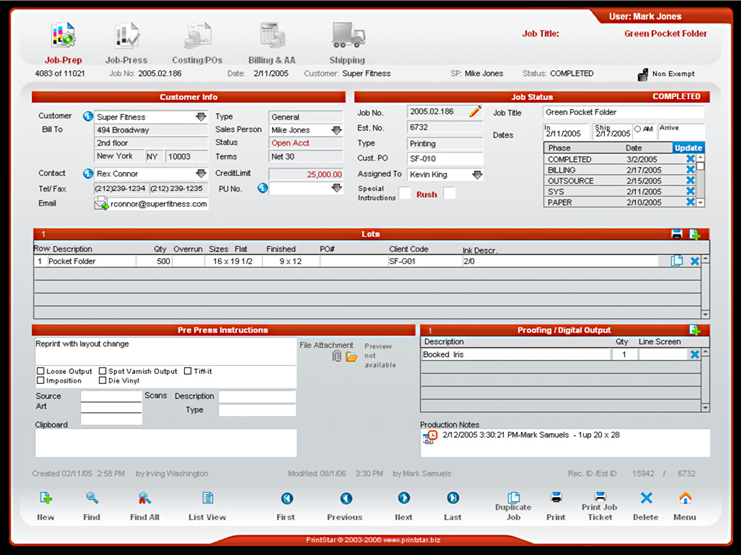 Ability to assign, track and update job status using built in job phases and barcodes. Ink Coverage Report – Ink details & coverage report for all forms in a job. Print proof review slips for customers to sign off or comment on. One click quick searches – find all jobs that are: Open, Completed, on Hold, Cancelled or Due soon.